Easy yoga postures to enter this pose from are the Child pose (Balasana) or Hero pose (Virasana). Take the arms behind you placing the hands on the feet. The top of the feet can be on the mat or for less strain on your lower back raise the tops of the feet off the mat and come on to the ball points of the toes. Pull the navel both up and back to reduce the strain on the discs in the lower back. Have the knees hip width apart or slightly wider. Push the pelvis forward and raise upwards with the navel and chest. Experiment with the exact hand placement. Different placements will offer different benefits. This subject is worth further study. This posture mildly stretches the quadriceps especially the rectus femorus. The lower back is stretched and the shoulders get a great stretch. If you come onto the ball points of the toes this yoga posture is easier on the lower back. However this variation will cause more pressure to fall on the knees. There is also another option of placing the hands on the mat and bending the knees more. Both of these options are very nice postures and closely related to the one shown. The shoulders can be opened for more space but it is a really nice stretch when the shoulders are stretched towards the spine. 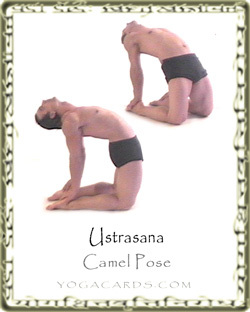 The Camel pose can be quite hard on the discs in the spine. Even if you do things like engage abdominals and other muscles to create space around the lower back. If students are injured offer them the easy option of placing the hands on the mat and allowing the knees to bend more.